Dr. (Wg. Cdr.) Ashis Roy born in 1932, served in the Indian Air Force for 21 years and after retirement settled in New Delhi in 1978 as a Practicing Physician Cardiologist. 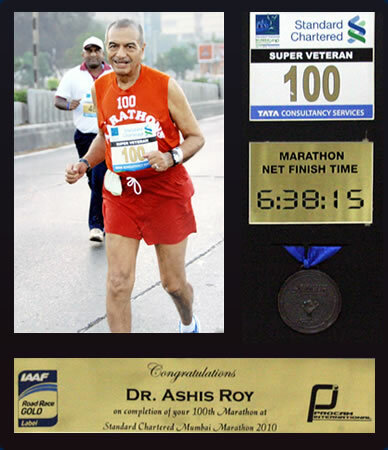 At the age of 50 years, Dr. Roy took up jogging and running to maintain good health. He ran his 1st Marathon at the age of 52 and by the time he became 83 years old, he has completed 115th Full marathon races, which is a National record for men in India. His achievements in the field of most strenuous sports of running 42.2 Km. marathon, is the rarest example of extraordinary excellence in sports. His achievements are enumerated in the following paragraphs. Roy’s 115th marathon races include 75 marathons in foreign countries like U.S.A (45 marathons), India (40 marathons), Canada (12 marathons), U.K. (2 marathons), and one each in Greece, Holland, Poland, Finland, Sweden, Norway, Japan, Korea, Malaysia, Macau, Australia, New Zealand, Russia, Germany, Czechoslovakia, Austria and Pakistan. 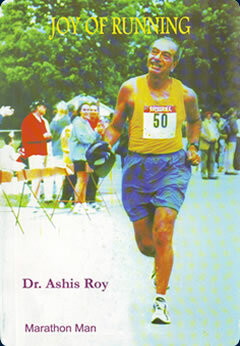 Dr. Ashis Roy has written and published himself a book on Running. The name of the Book is 'Joy of Running'.